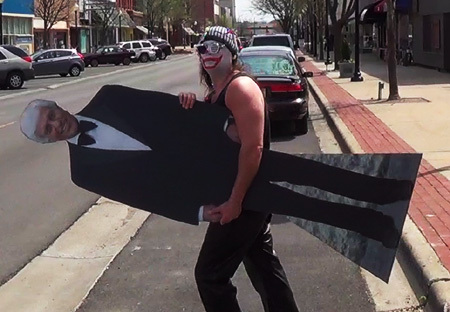 Originally unveiled in December to a packed hometown crowd, STRIPPER seems of a kind with previous YouTube (er, ScrewYouTube) videos that place the poker-faced rapscallion in comedic situations; nearly all his self-depreciating schemes involve Danville locations and faces more familiar to Vermilion County than our own. The movie features the faithful Ripper posse – Shawn Hosseini, Albert King, Chris Purviance, Sarah Woodard, Hema Rishi, and so on – with dozens more as well as cameos by Chicago indie producer John Borowski, a specialist in serial killer documentaries, and Philo Barnhart, an Oak Park resident whose career involved animation work with Walt Disney Pictures and Don Bluth Studios. Presumably, the jokes will fly and bodies fall with many of the trailer’s colorful characters involved in both! According to his autobiography on Amazon, Aurelian graduated from the University of Illinois in 2000 with a degree in Media Studies, Communication & Rhetoric. Apart from teaching and freelance writing, he has spent a good amount of effort spiraling Ripper and related efforts into a cottage industry of novels, children’s books, videos, and live events in Danville such as “Pop Goes the Culture Variety Show” and “Brouhaha! 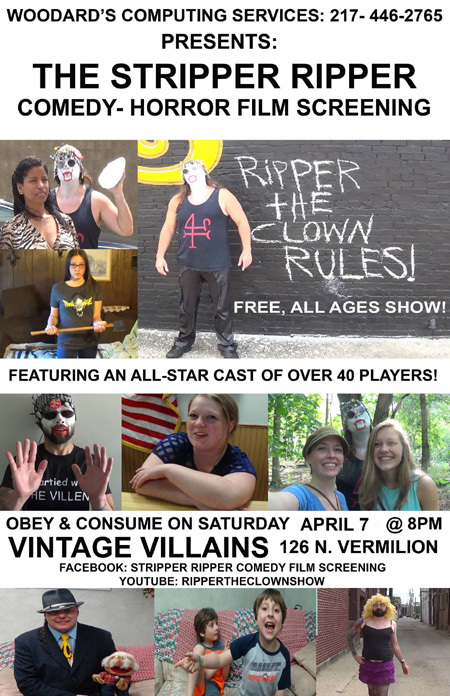 Stand Up Comedy Show.” You may have spotted him in Champaign-Urbana at the Dark History “true crime” convention and our own New Art Film Festival. Where might Ripper venture next? What might Ripper pull out of that tight-knit cap of his? Feel free to quiz him about origins, plans, and interactions with zombies and extraterrestrials this evening if you dare! He might even sign a STRIPPER RIPPER DVD for you if asked kindly. Doors open at 7 p.m., the movie begins at 8 p.m., and suggested donation at the door is $5. All ages are welcome. This entry was posted on Saturday, April 7th, 2018 at 1:45 pm	and is filed under For the Children. You can follow any responses to this entry through the RSS 2.0 feed. Both comments and pings are currently closed.